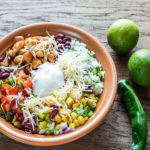 Chicken Burrito Bowl Recipe - Burst of Flavor In Every Bite! Chicken Burrito Bowl Recipe – Burst of Flavor In Every Bite! How many of us could eat a chicken burrito bowl several times a week? I am definitely one of those people! There is just something about taking a bite into such a flavorful dish that makes you crave more. 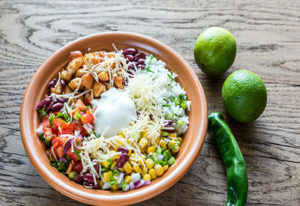 Delicious burrito bowl – bursting with flavor in every bite! It might be the burst of flavor that is unexpected and different with each mouthful. Or it could be the combination of textures, temperatures and flavors that stimulate every taste bud. Whatever the case, the lines to order a burrito bowl seems to get longer and longer every day. Luckily, making a delicious burrito bowl at home isn’t difficult at all. In fact, many of the ingredients can be prepared ahead of time and heated for a quick lunch or dinner. Make your seasoned chicken breasts on Sunday. You can not only use them in your burrito bowl, but it makes for a quick addition of protein on a salad or in a taco. Make your black beans ahead of time. Check out our recipe to make Seasoned Black Beans from dried beans. They are absolutely delicious and will save you money by making your own! How about making a big batch of rice for use throughout the week? Rice is so versatile and can be used not only in Mexican dishes, but is also great for a quick weeknight stir-fry or use as a filler in soups. An amazingly delicious burrito bowl recipe filled with bursts of flavor. Easy to make vegetarian and vegan friendly. Slice large chicken breasts in half horizontally and pound so that each breast is evenly thick. Salt and pepper the chicken pieces on both sides. In a small bowl, stir together the taco seasoning and white flour. Dredge each chicken breast in the mixture. Heat a large, non-stick skillet to medium-high heat and add the butter. Once the butter is melted, add the chicken in a single layer to the skillet. Cook for 3 minutes on one side and then flip to the other side and cook for another 4-6 minutes or until chicken is cooked through. Set aside and when cool enough to handle, chop into bite size piece. Stir in the juice of one large lime and 3 tablespoons of finely chopped cilantro to warm, cooked rice. Add additional salt and pepper to taste. Heat black beans. Add additional seasonings per taste. Heat a medium sized skillet over medium-high. Add 1 tablespoon of olive oil. Once heated, add corn, and cook, stirring occasionally, until slightly charred, about 5 minutes. Sprinkle with 1 1/2 teaspoons of the lime juice and a pinch of salt. Set aside. Chop lettuce into small, thin strips. Zest and juice one lime. Add the juice and zest to the blender along with the prepared ranch seasoning mix, minced garlic, chopped tomatillo, ⅓ of the bunch of cilantro, ½ of jalapeno (seeds removed for less heat), mayo and sour cream. Blend until completely smooth. Divide ingredients among 6-8 bowls. Add additional toppings: pico de gallo, cilantro, guacamole, sour cream, cheese and lime wedges, Drizzle the dressing evenly over the bowls. Love the new web site! And this recipe. Can be customized in so many ways. And! You can use what you have. My kind of cooking. Thanks! Thank you! Yes, the burrito bowl can be customized to whatever you have on hand! I made carnitas this week and made burrito bowls with that as well!